Starr County Sheriffs deputies assisted Bishop West investigators on an 8-Liner raid near Starr Country line September 18, 2015 west of Sullivan City. 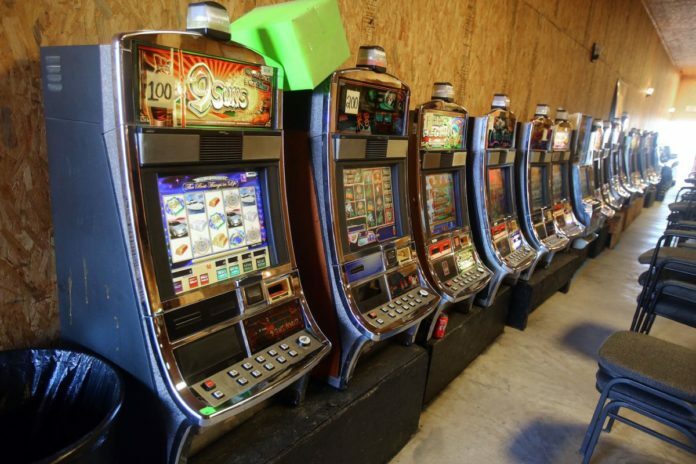 While Starr County may have cracked down on 8-liners, the gaming places have thrived in Willacy County. Across the Rio Grande Valley, many residents fly to Las Vegas to gamble or drive to Louisiana to play its casinos. But now, more players are cutting their travel costs with drives to Sebastian’s eight-liner arcades. For more than a year, the game rooms have been opening across this tiny rural community. “Since they’re not regulated, they should not be in a residential area,” Gonzales, a retired college instructor, said yesterday. Some game rooms have popped up near schools, others near churches and at least one a few feet from a new home. Now, about 10 game rooms draw players from across the region into the narrow neighborhood streets. “We’re Reno or Las Vegas,” Willacy County Sheriff Larry Spence said. Spence, who took office in 1985, said the number of game rooms has reached an all-time high. For months, residents such as Gonzales have been waiting for county commissioners to control the boom sweeping the county’s unincorporated areas. Today, commissioners are expected to consider ordering a moratorium on the issuance of permits used to build eight-liner arcades here. “The topic’s on their mind — for a change,” Spence said. County Judge Aurelio Guerra did not respond to a message requesting comment. “They’ve been looking at different options,” Spence said. Many residents are counting on action. “I’m encouraged that the county government appears to want to do something,” Gonzales said. As more game rooms open here, residents are concerned they are posing more of a fire risk. Now, residents are calling for commissioners to order the game rooms to comply with laws requiring distances be set to safely separate game rooms from homes, schools and churches. “Are they following the building codes and the fire codes?” Gonzales asked. Residents also want commissioners to lay down the law. In 2014, the state Legislature passed a tough ordinance specifically aimed at Willacy and Harris counties. The law would hit illegal game room owners and employees with fines of up to $10,000 per violation and charge them with Class A misdemeanors, requiring distances between game rooms, neighborhoods, schools and churches; prohibiting tinted windows and requiring that signs clearly identify the businesses as game rooms. In Harris County, commissioners unanimously approved the law known as House Bill 2123. But before an audience with ties to game rooms, Willacy County’s previous commission scrapped the law that then-County Judge John F. Gonzales Jr. tried to turn into a county ordinance. Three months after commissioners scrapped the bill, a game room opened in Raymondville Plaza, before eight-liners began popping up across Raymondville. After a tough Raymondville ordinance pushed most eight-liner arcades out of that town last year, more game rooms are opening in unincorporated areas such as Sebastian. Now, about 10 eight-liner arcades are in business here, Gonzales said. The county’s game rooms caught the state’s eye. In October, special agents with the Texas Department of Public Safety swooped into town to check on whether the game room’s security guards were properly licensed. “The violations that were discovered during these inspections will be handled administratively,” Sgt. Maria Montalvo, the agency’s spokeswoman, stated at the time. For six months, many residents have waited for commissioners to take action. In a July town hall meeting, residents requested Willacy County commissioners approve an ordinance to regulate game rooms in unincorporated areas. At the meeting, Guerra said commissioners would consider the request. Spence said he could not disclose whether authorities have launched an investigation to determine whether the game rooms are paying out cash.